Given the relevance of vitamin D in calcium metabolism homeostatic control, as well as its role as differentiation and cell proliferation modulator, it is important to study its circulating level in patients considered at risk, in order to develop prevention strategies. We studied 77 postmenopausal women with no history of osteoactive drug therapy, corticosteroid intake or diseases that could alter bone metabolism, attending the Menopause Center at the Hospital Provincial del Centenario, Rosario, Argentina. A medical history was taken, and a food consumption frequency questionnaire was applied in order to estimate daily calcium intake. To assess daily physical exercise, work and sports activities were investigated. Serum parathyroid hormone (PTH) and 25(OH)D were measured, and a hip DXA scan was performed in every patient. An inappropriate level of 25(OH)D was observed in 86.3% of patients. The 25(OH)D average value was found within the insufficiency range (<30 ng/ml) whereas PTH average concentration fell within the normal range, and bone mineral density average value was found within the osteopenic category. A statistically significant negative logarithmic association was observed between serum PTH level and vitamin D status (p = 0.01). Mean 25(OH)D concentration among patients who had reported fractures was significantly lower than the corresponding to women who had not suffered this type of event. Patients with vitamin D deficiency had significantly wider mean Cobb angle; higher sum of wedge angles of T4 - T12 vertebral bodies mean values, and higher uncompromised vertebrae wedge angle values than non-deficient women. This study shows high hypovitaminosis D occurrence among these postmenopausal women. Vitamin D is an important regulator of bone and mineral metabolism. Its main source is synthesis in the deeper layers of the skin through the action of ultraviolet B rays (UVB) on its precursor 7-dehydrocholesterol  . Another source of vitamin D is the ingestion of certain foods, and the intake of supplements  . Its metabolic status is modified by environmental and individual factors such as latitude, season, skin pigmentation, body composition, aging, diet, clothing, and sunscreen use. Serum 25(OH)D level has been considered as the most reliable indicator of vitamin D status  ; it reflects the state of repletion or deficiency of vitamin D in the body  - . Although there is no consensus among experts on what is the optimal concentration of 25(OH)D, a deficiency status has been defined for concentrations below 20 ng/ml   . Values between 21 and 29 ng/ml have been considered as indicators of relative insufficiency, and values greater than 30 ng/ml have been considered appropriate   - . Vitamin D deficiency is a reemerging health problem worldwide, particularly considering its multiple health consequences (morbidity and mortality)   . Regardless of the cutoff point chosen to assess the state of repletion or insufficiency of vitamin D, a high prevalence of hypovitaminosis D has been observed in all age groups, especially in postmenopausal women from all regions of the planet    . Geographical variations have been observed, in relation to different conditions of latitude, heliophany, environmental characteristics, sociocultural behaviors and lifestyle  . An international study on 1285 subjects found that half of the postmenopausal women evaluated in three Latin American nations had deficient levels of vitamin D  . Prevalence of hypovitaminosis D has been studied in a sample of 339 healthy adults from different regions of Argentina. The mean serum 25(OH)D was lower in the South (14.2 ± 5.6 ng/ml) compared to that in the Northern and Central regions (20.7 ± 7.4 ng/ml, and 17.9 ± 8.2 ng/ml, respectively)  . A rise in parathyroid hormone (PTH) level may occur in response to low concentrations of vitamin D, leading to an increase in bone remodeling and to a reduction in bone mass, both risk factors for osteoporotic fractures    . The main purpose of this study was to determine serum 25(OH)D concentration in a sample of postmenopausal women attending the Menopause Clinic at the Hospital Provincial del Centenario, and to evaluate the proportion of patients with 25(OH)D levels considered to be inadequate. Other goals were to explore the relationship between vitamin D metabolic status and other bone health risk factors in our patients, such as age, body mass index (BMI), sun exposure, parathyroid hyperfunction, femoral neck bone mineral density (BMD), history of fractures and thoracic spine morphometric variables (radiologic kyphosis—vertebral wedging). From May to September, 77 healthy home-dwelling post-menopausal women were studied. This time period corresponds to Fall and Winter in the Southern hemisphere. Women with history of osteoactive drug therapy, diseases that could alter bone metabolism, steroid medication or calcium and vitamin D supplements intake, were not included in the study. Patients underwent anamnesis, physical examination, and a food frequency questionnaire focused on dairy products consumption in order to estimate the daily intake of calcium. Daily physical activity was estimated from a seven day record of obligatory work (occupation), home duties, sports and recreational activities during leisure time plus sleeping hours as described elsewhere  . Weight was measured without shoes and in light indoor clothing using a clinical scale with a 0.1 kg precision. Height was measured by means of a stadiometer with a 0.1 cm precision. BMI was calculated by dividing weight in kilograms by the square of the height in meters. Fasting blood and 24 hours urinary samples were obtained, and routine laboratory and specific bone metabolism tests were done. 25(OH)D and PTH serum concentrations were measured by chemiluminiscence; total serum and urinary calcium by colorimetric method, ionized calcium by selective ion electrode; serum phosphate and alkaline phosphatase by kinetic method. In order to assess bone mineral density and to establish a diagnosis according to WHO criteria, a hip bone densitometry (DXA) was performed in each patient using a Lunar DPX equipment. Thoracic and lumbar spine X-ray films were performed to evaluate the presence of vertebral fractures defined according to Genant’s method  and radiologic morphometry procedures were done in thoracic spine, as described elsewhere  . Morphometric variables calculated and considered in this study were Cobb angle, sum of wedge angles of T4 - T12 vertebral bodies (SWA) and uncompromised vertebrae wedge angle average (MWA) as an indicator of structural vulnerability of non-fractured vertebrae  . Variables analysed were: 25(OH)D, PTH, total serum calcium and urinary calcium, ionized calcium, serum phosphate, alkaline phosphatase, BMD, BMI, age, age at menarche, menopause age and extension, parity, sun exposure, daily calcium intake, daily physical activity, history of fractures, immobilization for more than 30 days, Cobb angle, SWA and MWA. Description of categorical data is presented as absolute frequencies and percentages. The differences between proportions have been evaluated by Chi-square tests and Lineal Trend Test when appropriate. Quantitative data are presented as mean ± standard deviation (SD) and compared using Student’s t tests (for homogeneous or non homogeneous variances when appropriate). The analysis of small groups was performed using the Mann-Whitney U test. To test the association of serum 25(OH)D with other variables, crude and age adjusted partial correlation coefficients were computed. To assess the association between serum 25(OH)D and PTH, a nonlinear logarithmic regression model was adjusted. With the aim of selecting the appropriate threshold of 25(OH)D in relation to the values of PTH, two groups of patients were considered, taking 69 pg/ml as the threshold. Values of 25(OH)D were used to compute sensitivity and specificity of different cutoffs points, a ROC curve was constructed, and the area under the curve was calculated. All analyses were conducted using STATA 8.0 and p < 0.05 was considered as statistically significant  . This investigation was approved by the School of Medicine Ethics Committee, National University of Rosario, Argentina. Written informed consent was obtained from each patient. Three patients (3.9%) were excluded from the analysis because they decided not to complete the study procedures. The present results correspond to the remaining 74 patients. Table 1 shows the mean values and SD for quantitative variables, and frequencies for the qualitative ones. Sixty one percent of the patients were younger than 65 years and of these women 75.6% were younger than 60 years. Appropriate BMI was observed in 23% of patients while overweight and obesity were found in 40.5% and 36.5%, respectively. According to WHO criteria, 36.5% of patients had a normal T-score (>−1), 54.1% had low bone mass and 9.4% were osteoporotic. When considering the values of 25(OH)D of all patients in the sample arranged in strata of 5 ng/ml (Figure 1), 64 patients had 25(OH)D levels below 30 ng/ml. Of these women, 44.0% had values corresponding to the insufficiency category, whereas 42.5% had deficiency levels. Patients with inappropriate vitamin D concentrations were older than those showing appropriate levels, ages being 63.9 ± 9.6 and 57.7 ± 6.5 years, respectively (p = 0.052). Significant correlations were found between 25(OH)D and age, menopause extension, BMD and BMI. After adjusting by age, only the association with BMI remained significant (Table 2). When patients were stratified according to WHO criteria categories (T-scores > −1.0; −1.0 to −1.49; −1.5 to −1.99; −2.0 to −2.49; ≤−2.5), vitamin D deficiency was observed in 29.6%; 26.7%; 44.4%; 60.0% and 100%, respectively (lineal trend test: p = 0.001). Figure 2 shows this association. Since sun exposure might influence serum 25(OH)D values, we compared these levels among women who reported voluntary sun exposure and those who have not exposed themselves to UV radiation deliberately. Although the average 25(OH)D serum concentration attained by women who used to expose themselves to sunlight (26.2 ± 9.9 ng/ml) was significantly higher (p = 0.004) than that achieved by those without that habit (20.4 ± 7.0 ng/ml), it was found to be below 30 ng/ml in both groups. Table 1. Patients’ general characteristics (n = 74). Figure 1. 25(OH)D serum level distribution and vitamin D status of the patients (n = 74). Table 2. Pearson and age-adjusted partial correlation coefficients between 25(OH)D and other variables. Figure 2. 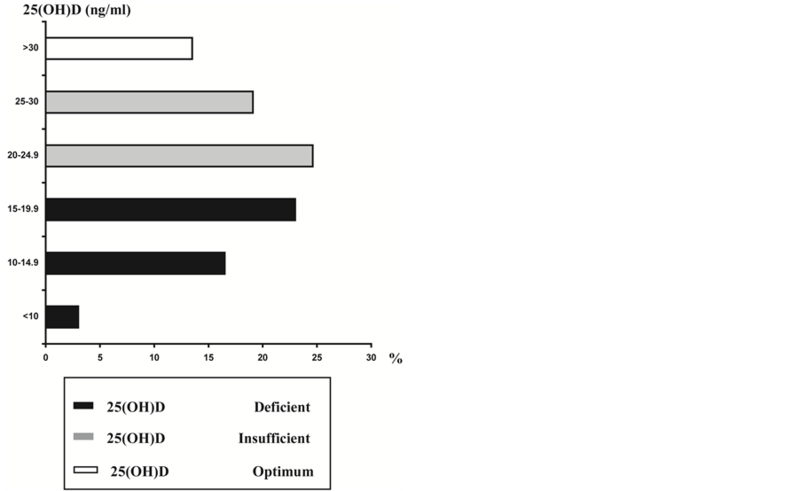 Association between vitamin D deficiency and T-score categories according to WHO criteria. that the 25(OH)D mean concentration of patients who had reported fractures was significantly lower than that corresponding to the women who had not suffered this type of events (16.3 ± 6.0 vs 23.2 ± 8.6; p = 0.030). The difference remained significant after adjusting for age and BMI (p = 0.037). A multivariate analysis was carried out considering 25(OH)D serum levels as dependent variable and age, BMI, sun exposure, menopause extension, BMD and history of fractures as independent variables. BMI showed a significant negative association (p = 0.017) and sun exposure a significant positive association (p = 0.006) with 25(OH)D serum concentration. Figure 3. PTH level (pg/ml) as a function of 25(OH)D serum concentrations (ng/ml). Table 3. Sensitivity and specificity (%) for different cutoff values of 25(OH)D.
higher MWA average values (3.9 ± 1.7 vs 3.1 ± 1.1; p = 0.035). To further explore the association between 25(OH)D and radiologic kyphosis expressed through these morphometric thoracic spine variables, eliminating the possible influence of vertebral fractures, 13 patients with prevalent vertebral fractures were excluded from this analysis. Table 4 shows the association between MWA and SWA and 25(OH)D in the remaining 61 patients without vertebral deformities and in the subgroup of inappropriate vitamin D status. In both groups, significant associations were found for MWA (p = 0.012 and 0.014 respectively) and SWA (0.013 and 0.015 respectively). Figure 4. Patient distribution according to fracture history and PTH. Table 4. Age-adjusted correlation coefficients between 25(OH)D and morphometric spine variables in patients without prevalent vertebral fractures. This study shows the high prevalence of vitamin D deficiency (42.3%) and insufficiency (86.5%) found in these groups of outpatient postmenopausal healthy women currently attending the Menopause Clinic. Besides, a high proportion of subjects younger than 65 years, a predominant normal or low bone mass and a high frequency of overweight/obesity were observed. Therefore, these findings are particularly relevant since they were registered in a sample of mostly young women. The frequency of vitamin D insufficiency observed in our study is considerably higher than that reported by Fradinger et al. who found that 46.4% of patients from a sample of 198 postmenopausal women of similar average age to the patients in this study, living in the city of Buenos Aires (Latitude: 34˚S) had less than 30 ng/ml. 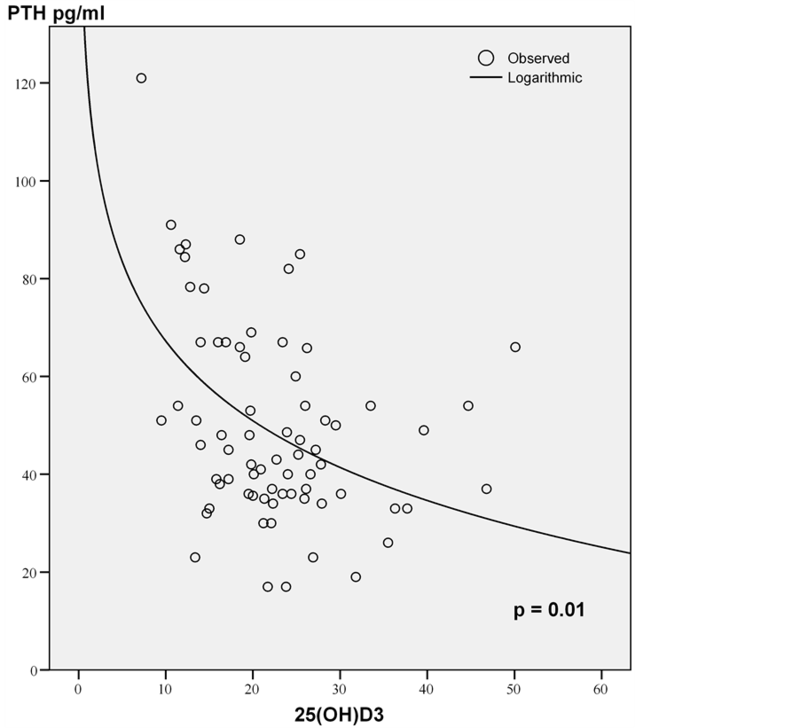 The average value of 25(OH)D observed in our sample (22.4 ± 8.6 ng/ml) is similar to that found by Oliveri et al. in another study carried out in 364 volunteers from different regions of Argentina. However, the mean age of our patients was lower than that cited by this group. A study performed in Santiago (Chile), a city located on the same latitude as Rosario (33˚S), in 60 postmenopausal women of similar age and BMI than the women from our study, reported an average 25(OH)D concentration of 19.5 ± 9.9 ng/ml and a mean PTH level of 57.2 ± 30.0 pg/ml  . A significant negative correlation was found between 25(OH)D and age in our patients, in agreement with the literature  - . Significant associations were also observed with menopause extension, BMD and BMI, according to other authors’ reports  - . However, after age adjustment, in our sample no association was found among vitamin D levels and hip BMD, and only the association between 25(OH)D and BMI remained significant. Fradinger et al. also found a modest correlation with hip BMD (r = 0.149, p = 0.036), but they failed to find a significant association between vitamin D status and lumbar spine BMD. In agreement with other reports   - , an inverse association was found between 25(OH)D and BMI, even after adjusting by several confounders. The finding of a mean BMI in the range of overweight has been systematically observed in our previous studies on postmenopausal women  - . 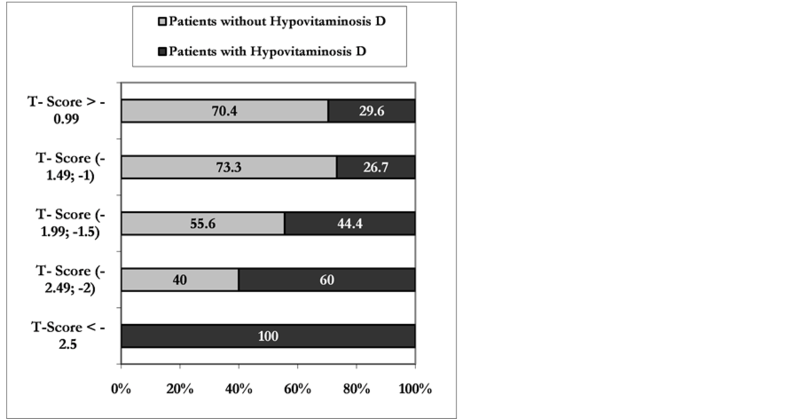 Adiposity could partially explain the high hypovitaminosis D prevalence rate in our patients. Sunlight contribution to optimal vitamin D status is a controversial area  . Limited sunlight exposure (25% of body surface/15 minutes a day) has been recommended to reach adequate 25(OH)D serum levels   . In our study, as expected, patients exposed to sunlight showed higher 25(OH)D serum levels than those not exposed to solar radiation. However, the average 25(OH)D level achieved by women having reported habitual sunlight exposure, was found within the insufficiency range. Furthermore, 30.8% of these patients showed mean serum levels in the range of vitamin D deficiency (<20 ng/ml). These findings are in agreement with observations from other authors  - . Several environmental and individual factors may influence the UVB effect on cutaneous vitamin D synthesis   including ethnic variability   . An interesting survey conducted in Lebanon, showed that residents from urban areas had lower vitamin D levels than inhabitants from rural regions  . Air pollution has been associated with vitamin D insufficiency   . Rosario is a densely urbanized industrial area with a high pollution level. These environmental conditions deserve further investigation because they may be in part responsible for a lower proportion of UVB rays impinging on the body surface of the citizens. Therefore, it seems that in these postmenopausal women, voluntary sunlight exposure does not ensure an adequate vitamin D cutaneous synthesis. According to some authors, in the absence of appropriate sun exposure, children and adults of all ages would need a vitamin D supplementation between 800 and 1000 IU per day   . In agreement with the literature, an inverse logarithmic relationship between 25(OH)D and serum PTH was confirmed   . In a survey of more than 900 Australian women  , PTH concentration was found to be associated with ionized calcium, age, weight and 25(OH)D concentration, with the latter variable being the determinant of greater significance in the multivariate analysis (r = −0.21). An interesting observation was that the weakest association found in the analysis was that between PTH level and age (r = 0.10). The cutoff point of the association between the concentrations of PTH and 25(OH)D in our study, defined by the ROC curve, was 18.8 ng/ml. Mean age of patients with elevated PTH concentration and 25(OH)D level below the selected threshold did not differ from women who had 25(OH)D serum level above the referred cutoff point, suggesting that the difference found in serum PTH levels in our sample is not due to the effect of age. In the Chilean study  , the best discriminative 25(OH)D value to separate patients with and without parathyroid hyperfunction was 15 ng/ml. However, while 16.2% of patients in the present study had elevated PTH levels, this proportion was lower in the Chilean sample (7.5%). A similar threshold value was reported by the Lebanese group  . Moreover, in the mentioned Australian study conducted by Need et al. , a significant PTH level increase occurred when serum 25(OH)D concentration fell to less than 20 ng/ml. The complex interaction among low vitamin D status, increased parathyroid response and bone fragility still remains unclear  . In our study, a positive relationship was observed between BMD (T-scores) and 25(OH)D concentrations in accordance with other studies  -  , although the association is lost after adjusting by age. In our sample, an association between fracture history and elevated PTH levels was observed. Besides, low vitamin D levels have been found associated with prevalent axial and peripheral fractures as shown in other reports  - . In some  - but not all of these studies  the significant role of increased parathyroid levels has been pointed out. In a recent prospective study, a cohort of healthy normocalcemic periand post-menopausal women was followed for 16 years. The risk of incident fractures was found to be significantly associated with increased PTH levels, and vitamin D status modified high PTH effects by increasing risk estimates with decreasing 25(OH)D concentrations  . The influence of low vitamin D status on vertebral fractures in postmenopausal women with elevated PTH levels has been reported recently  . As far as we know this is the first study indicating an association between low vitamin D status and morphometric thoracic spine variables. An increased Cobb angle in vitamin D deficient patients could be partly due to the observed prevalent vertebral fractures, as well as other issues that have not been examined (weakened muscles or degenerative disk disease). However, the finding of an inverse correlation between wedging of healthy non fractured vertebrae and 25(OH)D concentration is interesting. Low vitamin D status could take part in the kyphosis phenomenon contributing to the wedging deformity of still non-fractured thoracic vertebrae. In conclusion, this study found a high prevalence of vitamin D deficiency and insufficiency in a sample of healthy postmenopausal women. The association between a poor vitamin D status, the increased BMI and the insufficient sun exposure; the inverse relationship between 25(OH)D and PTH levels; the observed relationship between history of fractures and parathyroid hyperfunction, and the association between low vitamin D and wedging of healthy vertebrae (SWA and MWA) seem to indicate that these women are a particularly vulnerable group from the bone health point of view. Since life expectancy of women in our region is 78.2 years  , the findings that sunlight exposure does not assure appropriate vitamin D levels, and that prevalent hypovitaminosis and PTH hyperfunction may contribute to bone fragility, suggest that postmenopausal females attending our Menopause Clinic are at high risk of having prolonged suboptimal vitamin D status and suffer its consequences. Acknowledging the limitations of this observational study—including the sample size and possible selection bias—it represents a contribution to the knowledge of this problem. Masoni, A., Morosano, M., Pezzotto, S.M., Tomat, F., Bentancur, F., Bocanera, R., Tozzini, R. and Puche, R.C. (2005) Construction of Two Instruments for the Presumptive Detection of Post-Menopausal Women with Low Spinal Bone Mass by Means of Clinical Risk Factors. Maturitas, 51, 314:324. Stata Corporation. STATA 8.0. Statistics/Data Analysis. Jacobs, E.T., Alberts, D.S., Foote, J.A., Green, S.B., Hollis, B.W., Yu, Z. and Martinez, M.E. (2008) Vitamin D Insufficiency in Southern Arizona. The American Journal of Clinical Nutrition, 87, 608-613. Oren, Y., Shapira, Y., Agmon-Levin, N., Kivity, S., Zafrir, Y., Altman, A., Lerner, A. and Shoenfeld, Y. (2010) Vitamin D Insufficiency in a Sunny Environment: A Demographic and Seasonal Analysis. IMAJ, 12, 751-756. Tsiaras, W.G. and Weinstock, M.A. (2011) Factors Influencing Vitamin D Status. Acta Dermato-Venereologica, 91, 115-124. Holick, M.F. and Chen, T.C. (2008) Vitamin D Deficiency: A Worldwide Problem with Health Consequences. American Journal of Clinical Nutrition, 87, 1080S-1086S. Heaney, R.P., Davies, K.M., Chen, T.C., Holick, M.F. and Barger-Lux, M.J. (2003) Human Serum 25-Hydroxycholecalciferol Response to Extended Oral Dosing with Cholecalciferol. American Journal of Clinical Nutrition, 77, 204- 210.